A simple and delicious veggie stir fry, perfect for weeknights – Aloo Gobi made in Instant Pot. This translates to Potato Cauliflower in english. Aloo is Potato and gobi is Cauliflower, so this is a Potatoes & Cauliflower Stir Fry cooked in onion, tomato, along with aromatic spices such a turmeric & garam masala. 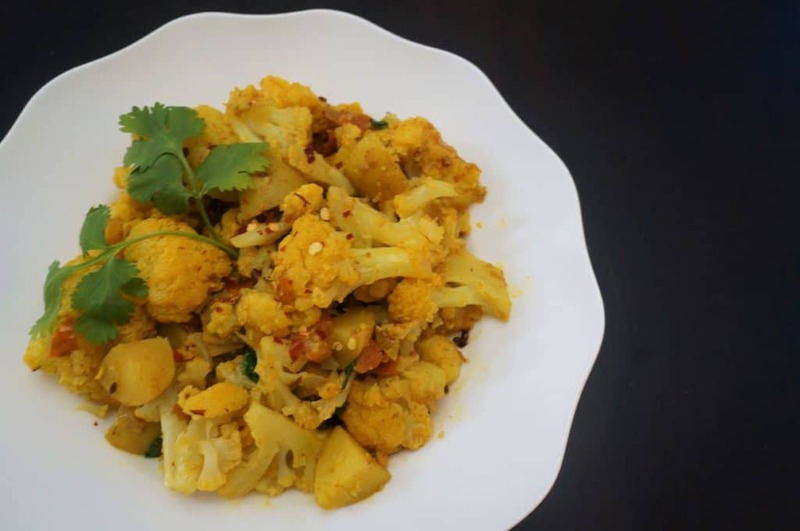 Aloo Gobi is a popular Indian dish you will find in every restaurant. It is so easy to make on the stovetop or in the pressure cooker. It just takes minutes to cook it and can be enjoyed with naan or paratha. When made in the instant pot, the texture of the cauliflower is well cooked, so if you want al dente cauliflower, you can reduce the cooking time to 0 minute on low pressure or make it in a pan on the stovetop. 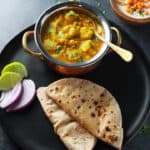 This is one of the best Indian Instant Pot Cauliflower Recipe. This is a great vegan and gluten free dish. If you are trying to reduce carbs or are on a keto diet, you can skip the potatoes. If you want to try other cauliflower recipes, try this Turmeric Cauliflower Soup. 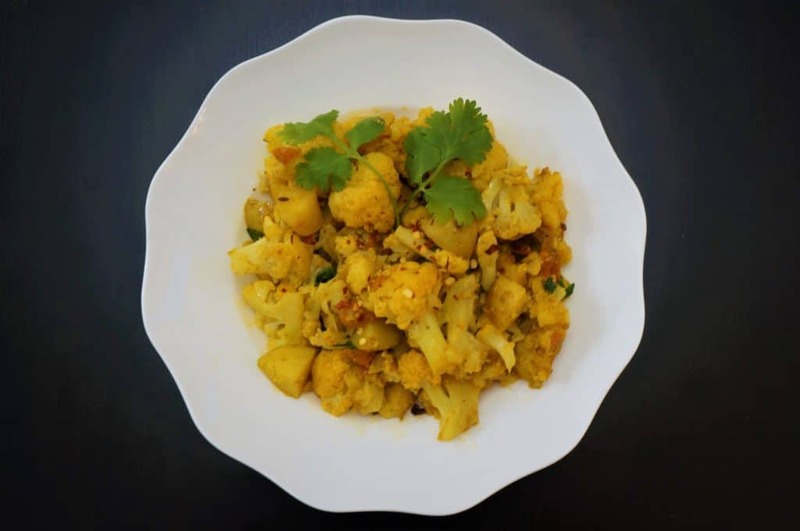 How to make Aloo Gobi in the Pressure Cooker? I like to use Low Pressure setting for veggies. You will also find that in other veggies I have made in the instant pot – Cabbage & Peas Stir Fry and Okra or Bhindi Masala. You might notice that I don’t add any water while cooking Aloo Gobi. Yes, that is correct! The cauliflower usually has enough intrinsic water that gets released when it cooks. That water is enough to get the instant pot to pressure. However if you are worried, feel free to add 1/8 cup of water along with the cauliflower, especially if anything is stuck to the bottom of the pot while sauteing. It takes about 8-10 minutes for the ip to come to pressure and then 2 minutes of cooking on low pressure. It is important to cut the potatoes smaller in size, so they get somewhat cooked while sauteing initially and then can get cooked in 2 minutes of low pressure. Another important thing is that this requires a quick release, otherwise the veggies will get overcooked. 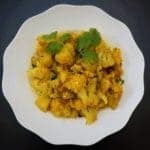 Enjoy this easy and delicious Aloo Gobi with naan or paratha. A healthy & delicious potato and cauliflower stir fry made in the instant pot. So easy and quick, takes just 20 minutes. Vegan & Gluten Free. Start the instant pot in SAUTE mode and heat oil in it. Add cumin seeds and green chili. Saute for 30 seconds. Add diced onions, ginger and garlic paste. Stir them. Add chopped tomatoes and all spices. Add potato cubes and stir it all up. Saute for 2 minutes, so the potatoes are slightly cooked. Add cauliflower florets and stir well. Scrape off anything stuck to the bottom of the pot. If needed, add 1/8 cup water to deglaze the pot. Press Cancel and close the instant pot lid. Set the instant pot to MANUAL or pressure cook mode at low pressure for 2 minutes. It will take 8-10 minutes for the instant pot to come to pressure. Add the dry mango powder and garnish with cilantro. Aloo Gobi is ready to be served. If you are worried about making Aloo Gobi in the instant pot without adding water, add 1/8 cup of water along with the cauliflower. If you want a little more heat, add more cayenne or 1/2 tsp of garam masala. If you don't have dry mango powder, replace it with 1 tablespoon lemon juice. Stove top variation: Follow the same steps, cook it covered with lid for 5 minutes, Then remove lid and cook it for 10 minutes. 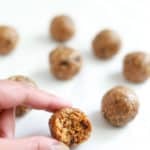 Low Carb or Keto Variation: Skip potatoes. So happy to hear you enjoyed the Aloo Gobi. Thanks for sharing back your review. 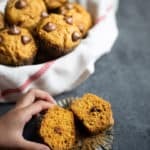 Would love to hear if you try any other recipes. Tried this. I ended up adding a little water to it to get IP to come to pressure. Hey Anand – I have seen that it does vary from ip to ip, and sometimes water is needed to get the ip to pressure for Aloo Gobi. Thank you for sharing back your experience. I hope it tasted good! Going to try this recipe next. I have an 8qt instant pot so do you suggest adding the 1/8 cup of water? Hey Kiara – I do suggest to add the 1/8 cup water in the 8qt. Due to the more surface area, the 8qt usually needs more liquid in the pot. I hope you enjoy the Aloo Gobi! It turned out really well and was so yummy! I just got an Instant Pot and have made your Chicken Saag recipe three times so far. What type of green chile should I use in Aloo Gobi? Should it be a jalepeno? 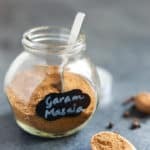 I don’t live near an Indian market, so do you have a recommendation for an online source for spices? Hey Lisa – Glad to hear you have been enjoying the Saag Chicken. I usually use Serrano or birdseye chili pepper, however feel free to use any that you have. Just make sure to adjust the spice and quantity of pepper to your taste. Amazon has most of the indian spices, you can find the links here – Indian Spices. Many in instant pot groups have suggested Penzeys spices, so you could consider that too. Hope that helps! 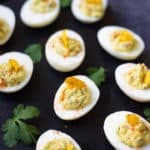 I am so psyched to find this recipe. 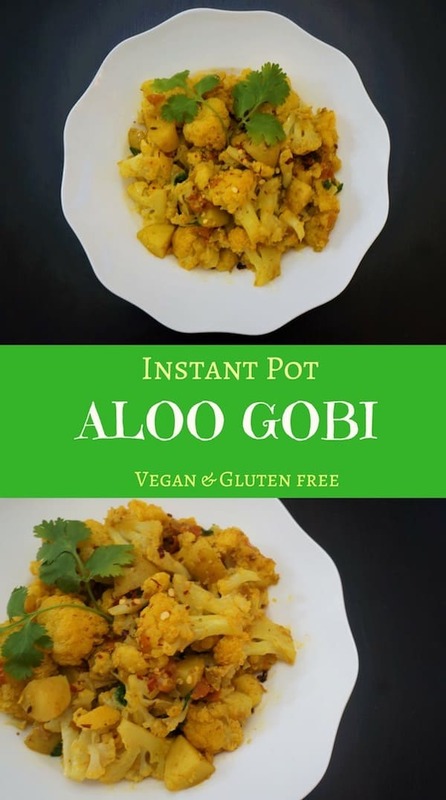 Aloo gobi is my very favorite dish to order, and I have just received an instant pot as a gift. This is going to be the very first thing I make! Thank you! Hey – Welcome to the Instant Pot club! I am sure you will love it. Looking forward to hear how you like the aloo gobi ???? Can I double the quantity without changing the cook time? Yes, the cooking time will be the same even if you double the recipe. Thank you for the simple yet delicious recipe. Made it using the instant pot. Turned out very well. I tried this recipe like exactly how you said.. it came out well.. but it got scorched at the bottom .. any ideas how to prevent this?? Hey Riya – I am glad to hear the aloo gobi came out well. I wonder if anything was stuck to the bottom of the pot before you started pressure cooking? Also, just curious to know if you were using a 6qt or 8qt? Thank you!